So you’ve decided to dive into the world of effective email marketing. Do you know what you’re getting into? OutboundEngine is a personalized email marketing service that can put your marketing efforts on “autopilot” by sending out bimonthly emails and social media posts a few times a month for a modest fee, but there are still some best practices for how to use this powerful business and networking tool. Since 2012, the Austin, Texas-based company has provided email marketing campaign creation and management to professionals in the real estate and mortgage industries, but it also serves companies in the insurance, home contractor and legal sectors. “There is a lot of noise around marketing products in these industries, but it’s just a ton of lead generation, advertising-type products, and the majority of those products have not addressed the long tail of nurturing customers and prospects over the long term,” said Branndon Stewart, founder and CEO of OutboundEngine. Some companies have struggled to find a way to reach their customers and clients using email marketing campaigns, Stewart said. “They have three options,” Stewart said. “The first option is to hire someone to do it, like a PR agency or an in-house marketing employee. “The second option is to try to do it yourself, but if you are a real estate agent, you have a ton of stuff on your plate already. Putting together email and social media campaigns, keeping up with technology and generating regular, unique content is overwhelming. For a $149 per month fee, OutboundEngine will create two email campaigns per month that contain personalized branding and professionally written content geared specifically for the user’s intended audience. OutboundEngine also sends out customized social media posts on different networks like Facebook, Twitter and LinkedIn, and manages subscription lists and requests for the user. “We knew that building these campaigns yourself was not something that was going to happen for most, and hiring someone was too cost-prohibitive, so we’re in the middle,” Stewart said. However, email marketing has become a bit of an art form, and it helps to understand some basic philosophies if you want to make the most of your investment. Here are three tips Stewart shared to make sure your email marketing hits the mark. Deliver content that is timely and relevant for your customer base, Stewart advised. “I always say: Be useful. Don’t sell, help,” he said. Examples of useful content include tips for making sure your home is efficient in the summer, how to create curb appeal if you are thinking of selling your home, or informing buyers and owners about current rebate opportunities. By giving your audience interesting content devoid of blatant sales pitches, you can retain their interest long after they have purchased a home, opening the door for repeat business in the future, Stewart said. “The reason we do what we do is to help our customers build long-term relationships over time, get good business, get good word-of-mouth referrals and maintain permission to communicate with them. “At any point in time, if they haven’t heard from you since you closed on their house two years ago, they may not even remember who you are. It is important not to miss out on these opportunities to be at the top of their minds,” Stewart pointed out. OutboundEngine provides users with up to 10 social media updates per month, but it doesn’t just write one post and push it across Facebook, Twitter, LinkedIn and other channels. “Each post is individually optimized for each channel,” Stewart said. For example, Facebook tends to be more casual, while LinkedIn is used primarily for business networking. Twitter only allows messages within a certain word count limit. “Different channels have different audiences, and people use them for different reasons,” Stewart said. OutboundEngine not only handles subscription requests and deletions, but it also gives customers full visibility into their campaign results. It provides performance metrics and gives insight into what the audience clicks on — in terms of both overall results and trends, and down to the individual level. “You can call us and ask us to look up a particular user, and I can see when the campaign was sent and what they clicked on and what action they took,” Stewart said. OutboundEngine has 6,000 members. The company recently launched an “enterprise” sales team to better serve larger organizations and landed its biggest client to date: San Antonio, Texas-based Legacy Mortgage. 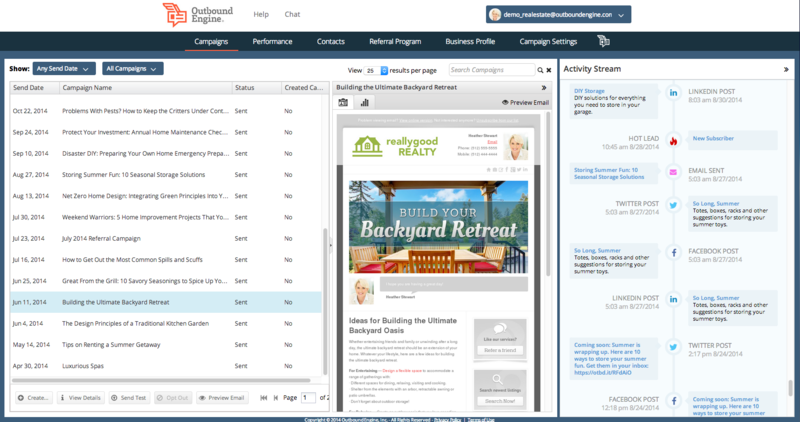 OutboundEngine will create and manage email marketing campaigns for 40 of the mortgage lender’s loan officers. “As the mortgage industry becomes progressively a more ‘high-touch’ playing field, it is important for us to stay aggressive in leading that charge with our loan officers’ communications to their clients and partners,” said Dan Diepenhorst, president of Legacy Mutual Mortgage.